So let’s get real green and do something useful with some of them…shall we? Start with a regular t-shirt that has lived a good life…no guilt now. It’s going on to a better place…really. so you have a tube of fabric. Fold it nearly in half, leaving the under side sticking out about an inch. 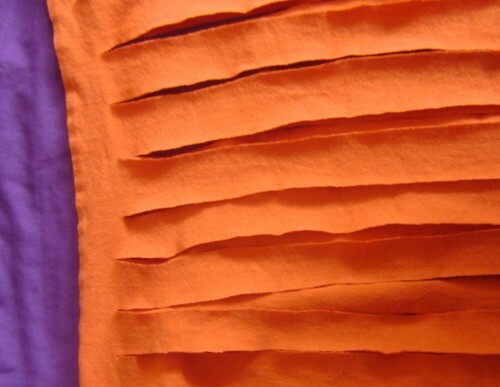 The easiest way for you to hold the fabric and cut it into one continuous strip is to slide your arm through the two layers of fabric 1 inch uncut margin running along the top of your arm. 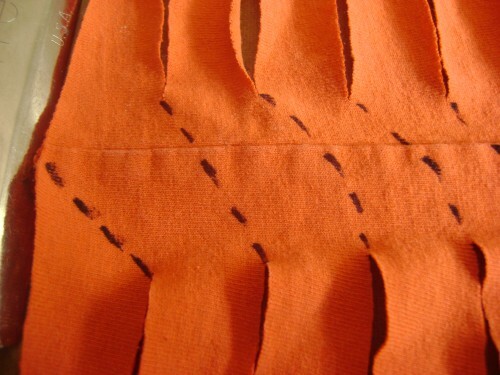 I drew dotted lines showing where you’ll cut your fabric–but you don’t need to draw the lines. You’ll be amazed at how fast you can figure this out and it’s really fun too, and for some reason deeply satisfying. If you need more instructions click HERE for a sweet little diagram and bag pattern. 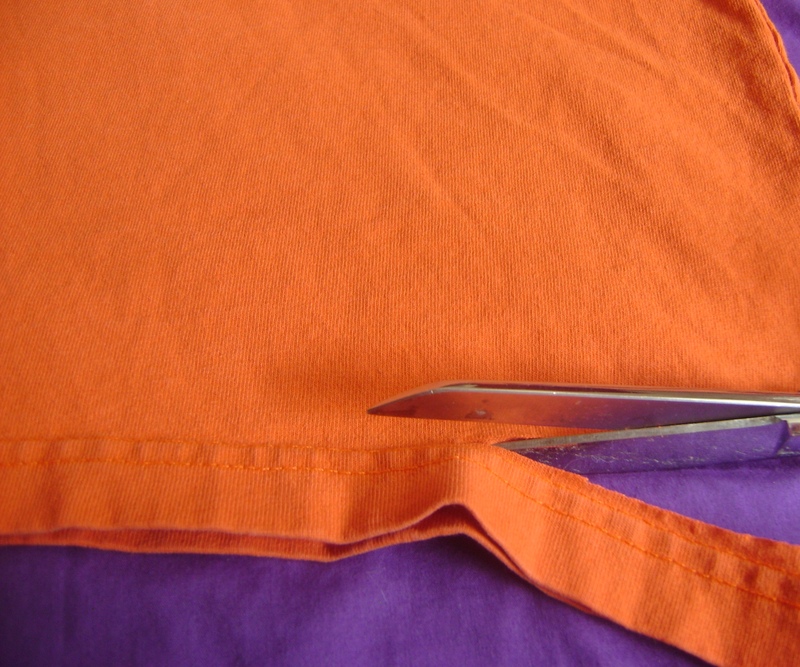 When you’re finished cutting, you’ll have one long, long, strip of fabric. Are you ready to make it more “yarn” like? Here goes! 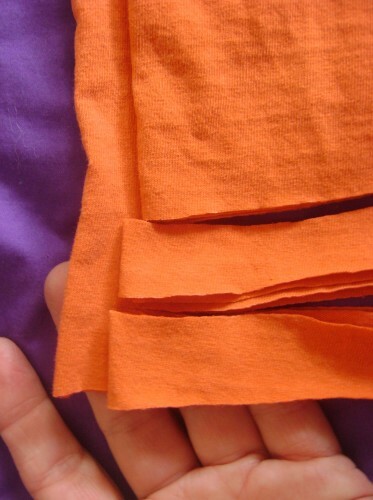 Going down the entire length of your fabric, take a hold of it by one end and gently stretch it. It will magically curl up and behave it’s self just like it should. Very obedient stuff, I tell you. 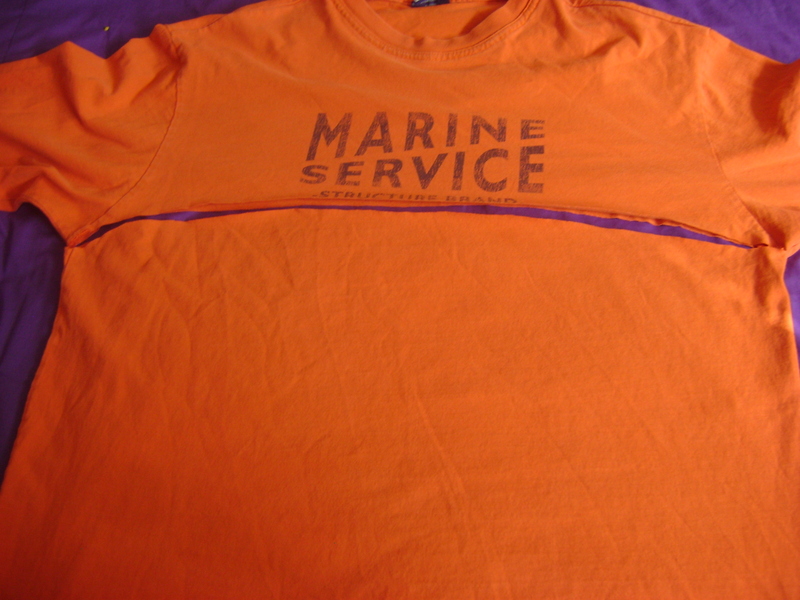 but that color is too…too…orange not to be used properly. go dig out the old shirts. The stack’s about to shrink. I didn’t know you could do that!?! It looks great though. What are you going to make with it? How does the “yarn” feel when it is crocheted into something else? That is pretty cool. I really don’t have any old t-shirts. Isn’t that weird? John does but he uses them for working in the yard or on the cars. Can’t wait to see what you make out of this. I love the idea! I think you could make all kinds of things with it. I was thinking throw rugs and handbags, but I am sure it could be used for a lot more. Now I know that I really need to learn how to crochet! I can’t wait to see what you make with it! 🙂 How fun. I like how it curled up… SO cool! It’s quite sturdy. I’m messing around now with different sized hooks–that will make a difference. No shirts? Serious? 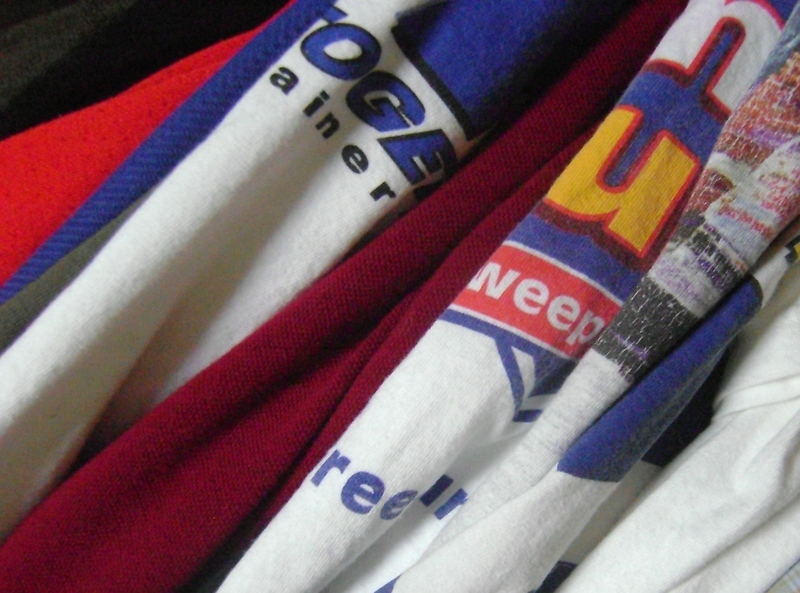 Well, then you can’t be in the shirt hoarder’s club…unless you swipe some of John’s. He’ll never know. There’s a link to help you learn at the bottom of the Crafting Tutorial’s page. It’s really soooo fun–I know you’ll love it! Seriously, that was the funnest part. This is a great tutorial, I like the idea of a continues strip. Would you like to use it as a guest post? Your site looks great! I do hope you try the t-shirt yarn. You’ll love it magnamoniously!! What a fabulous idea!! I’d think it would be much sturdier too. Good thinking! Thank you Launi, I’m not sure what guest posting entails, but I will be happy to link to this tutorial. Thanks! 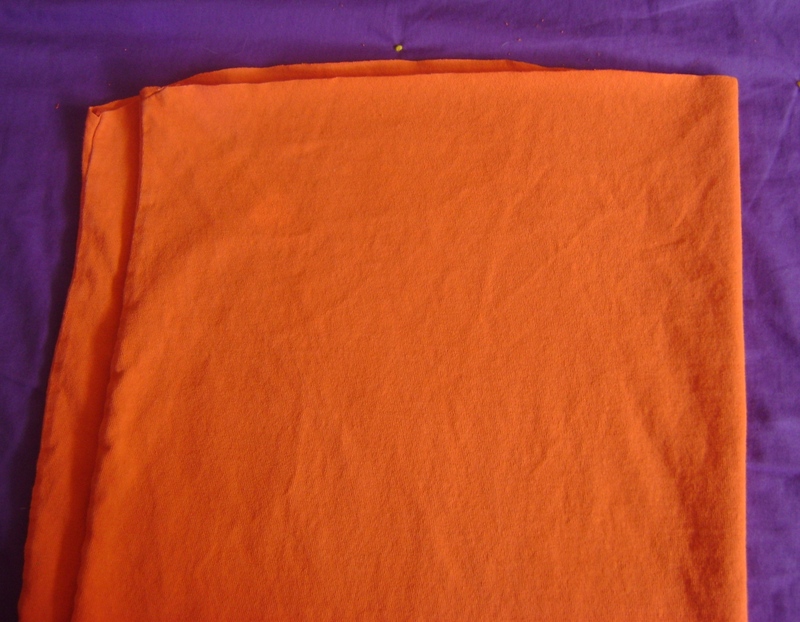 One could probably find cheap shirts at a goodwill ot thrift store…it is not that I don’t have shirts, it is that they aren’t colorful enuf… I like color! Beats all the boring white ones! I was thinking of making a blanket since the sheets are so comfy. Any suggestions on how to cut it quickly and easily into one strips? I was prepared to sew them all together after I cut strips and have shelved the idea up until now due to that. if your strips are not crazy long, it’s not too hard to join them as you’re working when you’re doing crochet. Two methods – one, joined a strip on top of the other while you continue to crochet being my own favorite. It means that for one single crochet, or half a double, you’ve got double the yarn on your hook, but it’s otherwise a nice and smooth join. Just try to avoid it during chaining. 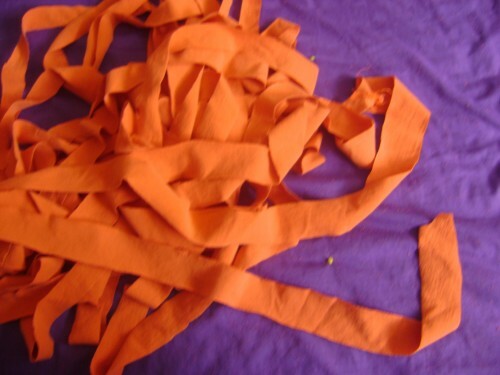 Second, cut a small slit into the ends of the original piece, and a matching small slit into the second piece, going the LENGTH of the yarn, not across the width. Lay the end of the new piece on top of the old piece, with the slits matched up. 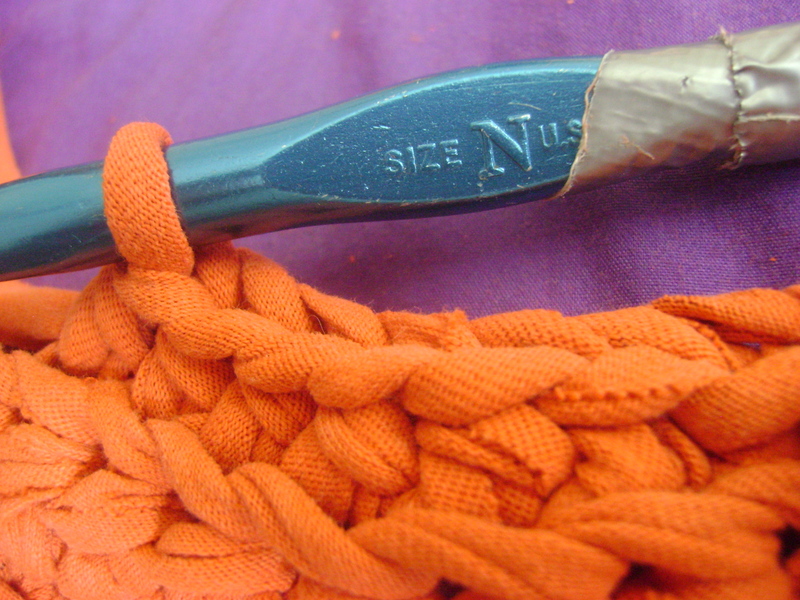 Then pull the unsnipped end of the yarn through the holes, smoothly tug it tight, and you have a classic join. my only concern that the ‘yarn’ will be too stretchy and eventually stretch out and be too loose. is this completely resolved by just using a smaller hook and tighter crocheting? They never really get too stretched out. They loosen up a bit but it is quickly solved by washing and drying them–in the dryer, if you can believe that. 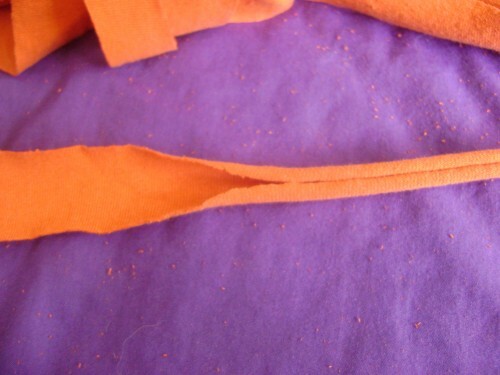 I’ve used a smaller hook and it makes the “fabric” much firmer. So you just have to decide how you want it to work. This is such a cool idea! I am a college crafter and so cheap ways to make new things are the best! I’ve been thinking about making a warm headband/ear warmer for myself but haven’t been able to get out to buy the yarn. Now I have no excuse, because I think this would be an awesome way to use this t-shirt yarn! I actually came across this the other day and had to go out and buy myself an XXL tShirt to try it out. Looking forward to seeing what you make with it. I have been looking for these instructions! I love the way you explained it all. Very funny too! Thanks! I hope you’ll show us what you make. We’d love to see your project. omg that looks cool! Oh yeah, i have da same name as u!! 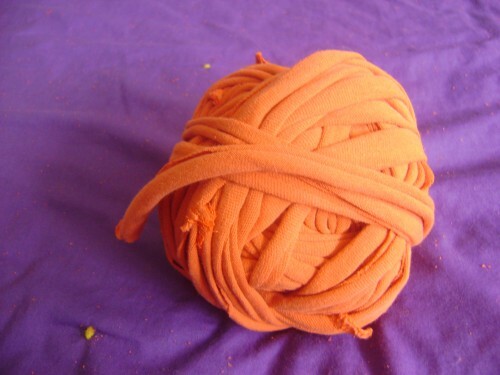 So far all I’ve made is ball of t-shirt yarn. Lol. I can’t find my really big hook. I cut my strips too wide. I need to cut another shirt and play with it. Oh, if someone wants to do this trick with knit fabric yardage or a knit sheet like mentioned, all you have to do is sew up one side to make fabric tube then cut it just like the t-shirt. But… wouldnt you have to tie the strips together at the ends to make it long and therefore youd have knot ties in what your making… unless im missing something? This is awesome. I hadn’t seen a way to keep the T Shirt in one loop before. I think I want to make a mat for my dog out of some of my old T Shirts. Her nails won’t get caught and it should wash right up if she lays down after getting dirty. Thank you for sharing this! LOVE this and can’t wait to try it out!!! I was here the other day and went to the link you provided for further instructions and a pattern for a bag… tried again today and the link is gone! (It just takes me to Crochet Magazine’s homepage.) Do you have any way to get back to it?? I really wanted to make that bag! Thanks!! I copied and pasted it into a Word document so I could keep a copy for myself in case this one disappears too! Thanks for looking into it and thanks for your great blog! Oh, my goodness! It’s beautiful too! At last, at last–I don’t have to just make rugs and pumpkins! Thanks my dear. What do you do with the hem and top of the shirt? Welcome-welcome! Check the archives–we’re loaded with fun stuff. :} So glad you’re with us. Yes…I can do that. I’ll work on it. Thank you for your very clear tutorial. I agree with you – making the yarn is strangely satisfying. Put a link to this tutorial on my blog. Now I’ve got to find more t-shirts so I can make more yarn so I can craft something seriously cool. Great to have the marker directions on where to cut at an angle with an up-close shot..most other videos it is too hard to see what they really are doing. Yours clarifies that 100% Thanks. 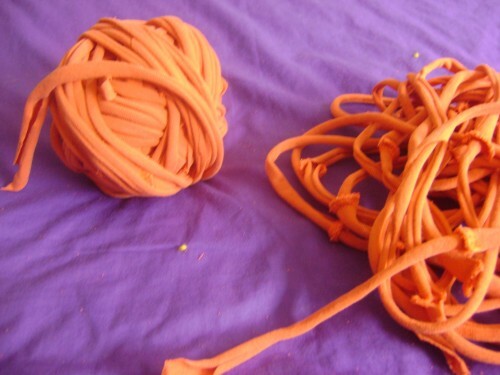 I have seen people use the tshirt yarn but could not figure out how they did it. I bumped into your site and love the easy instructions. AND… I need to clear out some old tshirts from my hubby’s closet. 🙂 Now, I know what to do with them. I probably have some in my side of the closet, too. I just started to buy yarns to knit again after 27! years!!! Can you believe it? That long! I saw t-shirt yarn for sale but was wondering about what the heck you do with it. 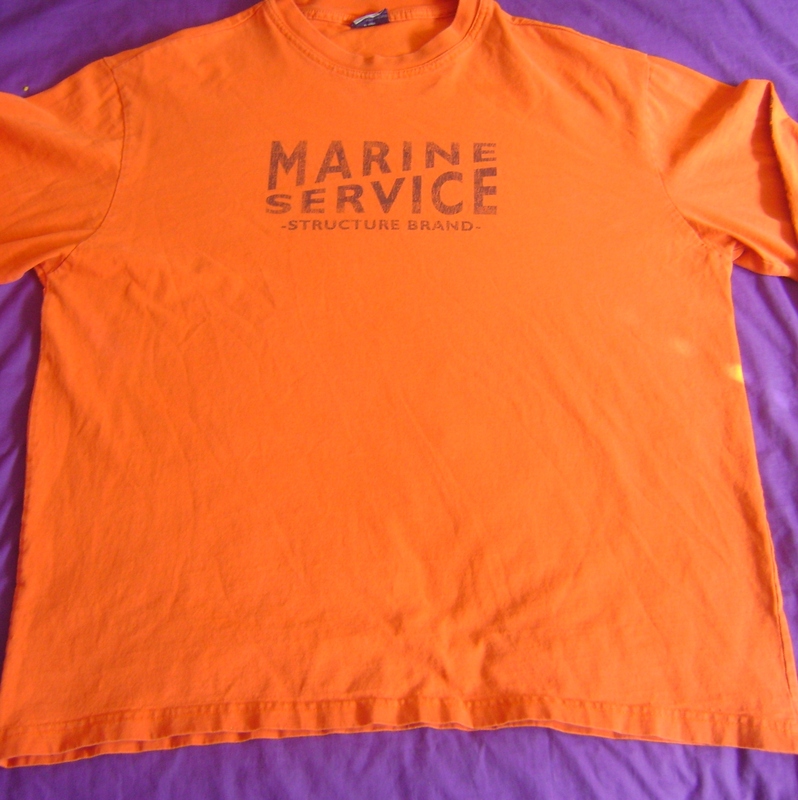 Lucky me, my bf hoards t-shirts and I am constantly nagging him for getting rid of some. I will make them dissapear! He won’t even notice. The idea of doggie rag sounds good. 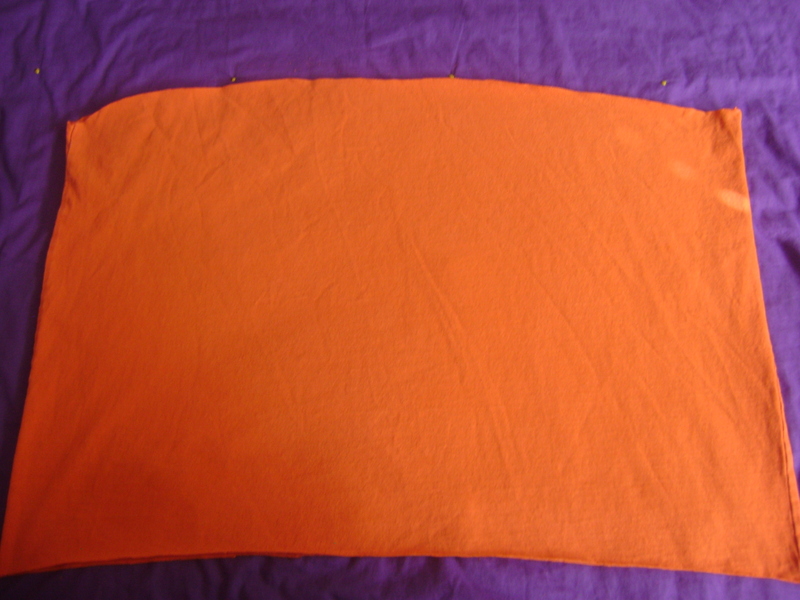 One of my dogs sleeps mostly on the floor only-his choice (we do have doggie beds and they can sleep wherever they want anyway, even in our bed), so I will make him t-shirt blankie! Thank you allfor all ideas! And PLEASE, English is not my first language, so forgive me!!!! Thank you all for all ideas! Could you do this with jersey sheets? How would you cut them? Also sometimes goodwill sells bundles of tee shirts as rags. Fyi. If you undo the stitches in the hem instead of cutting it off, you get another full strip of yarn! I love your picture on cutting but do you cut completely through to the other side or stop at a certain point when making the yarn? I meant to say after you unfold and cut on dotted lines. Do you cut all the way through or stop at a certain point?